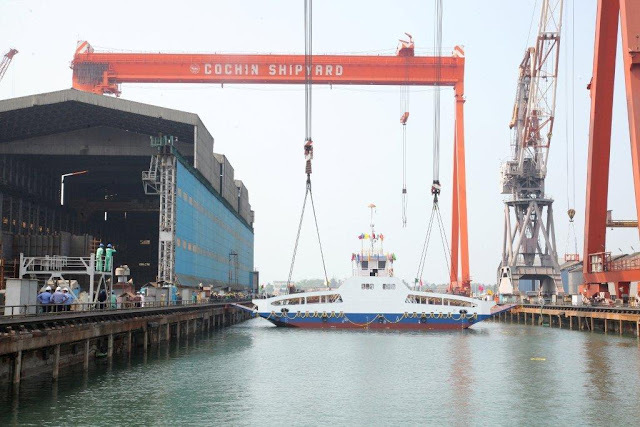 ​Mumbai, Janurary 11, 2016:​ Cochin Shipyard today launched the second “double ended RoRo Ferry” today. 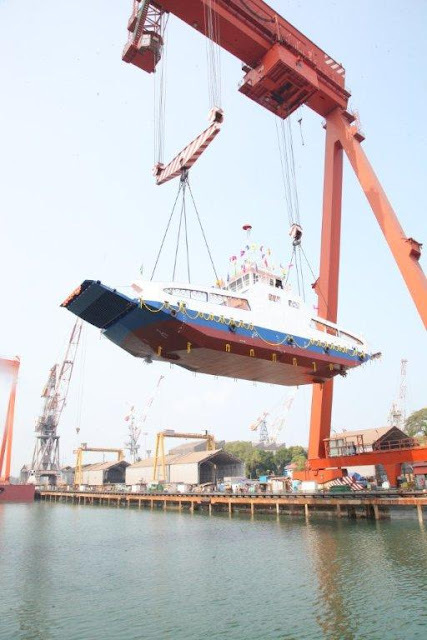 The ceremonial event of launching of the vessel was held at CSL at 1030 hrs. 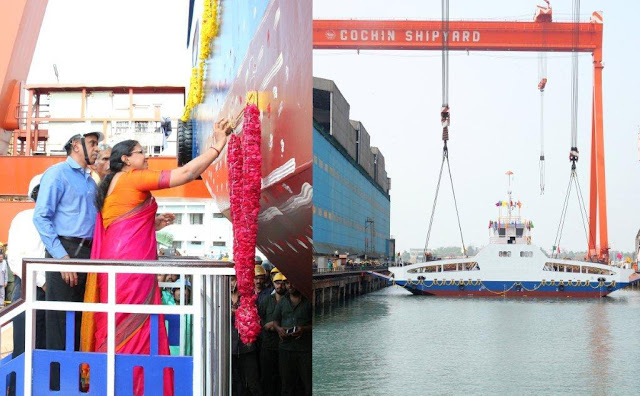 Photo 1: RORO Ferry launched by Smt Rameetha K, Scientist 'G', NPOL, Kochi and wife of Shri Madhu S Nair, CMD. Photo 2 & 3: RORO Ferry for Corporation of Kochi. The vessel was launched by Smt Rameetha K, Scientist ‘G’, NPOL, Kochi and wife of Shri Madhu S Nair, Chairman & Managing Director. Smt Rameetha, broke the ceremonial coconut declaring the readiness of the ship to be launched into the water. C&MD, Directors and employees of CSL were present on the occasion. Thereafter, the vessel was lifted over by the mammoth 300 Tonne Gantry crane and launched into water. The vessel is the second of the series of the double ended Roll-on Roll-off (RoRo) ferry project undertaken by Cochin Shipyard, following the demand for a safer and reliable alternative for traditional ‘Jangars’ across the busy shipping channel between Fort Kochi &Vypeen, the two major islands in Ernakulam. The vessel has been designed in-house at CSL and has been built to Indian Register of Shipping (IRS) Classification Rules and Kerala Inland Vessel (KIV) rules applicable for inland vessels in the state and the innovative design will be first of its kind made in India. It can carry 12 cars and 4 trucks or 18 cars besides 50 passengers with an endurance of abt. 5 days. The vessel is equipped with azimuth propulsion systems on both ends for easy manoeuvring, allowing it to be operated without the need for turning around at the jetty during cast-off, thereby considerably reducing trip time. The ferry can attain a speed of up to six knots and will take around three minutes to cross the 600-metre distance between the two stations. The vessel features an air-conditioned wheel house for the comfort of the operator and has a number of inbuilt safety features. With this the second in a series of two double-ended Roll-on-Roll-Off (Ro-Ro) ferry, Cochin Shipyard is making a clear stride ahead of its peers in the newly developing Inland navigation segment of our country.